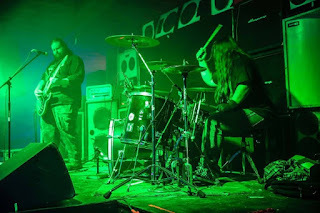 Coffin Torture Streams New Song "Bolted Down, Boiled To Grease"
Doom duo Coffin Torture have teamed up with Cvlt Nation to stream their track "Bolted Down, Boiled To Grease". The song is taken from the band's upcoming album "Dismal Planet" which will be released via Sludgelord Records in February. The band commented "We're excited to have The Sludgelord unleash our first full-length album. Dismal Planet is coming soon. Prepare for filthy riff destruction!" Listen to the song here: http://www.cvltnation.com/premiere-streaming-coffin-torture-bolted-boiled-grease/.